This ❤ Google Activity ❤ is an engaging practice of Conjugate Root Theorem & Fundamental Theorem of Algebra. 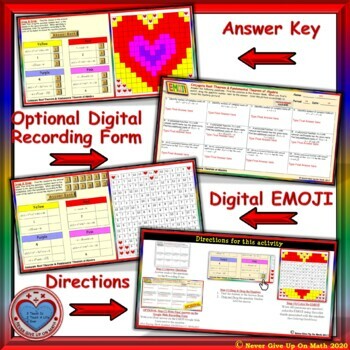 This is a BLENDED Activity where a hard copy (which is sold separately at my store here) of the activity is also included. ☑ Questions 9-12:Students are asked towrite a polynomial functionwith rational coefficients given some roots (will have to use the conjugate root theorem and the understanding of the Fundamental Theorem of Algebra). In questions 9 through 12, the roots that are given are all MONOMIALS (Nothing Binomial). Please see the preview above. A Step-by-Step Answer Key is included in this EMOJI. In the Google portion of the activity students will be using Google Slides. Some students used their computers, some used their phones, while others used their IPADs. As long as there is a Google Drive there is a way.